The sacred arts play an essential, intrinsic role in Tibetan Buddhist practice. Here, one of the great practitioners and master artists of our time presents a guide to the Tibetan Buddhist path, from preliminary practices through enlightenment, from the artist’s perspective. With profound wisdom he shows how visual representations’ of the scred in paintings, sculptures, mandalas, and stupas can be essential support to practice throughout the path. 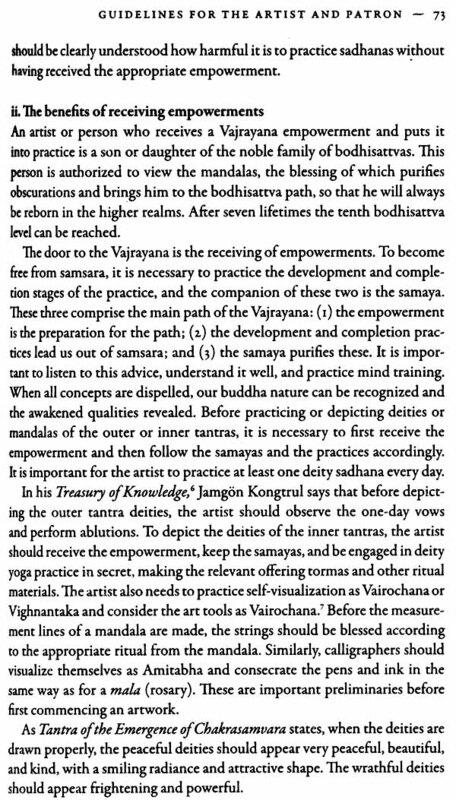 This work, based on the author’s landmark Tibetan text, The Path to Liberation, includes basic Buddhist teachings and practices, clearly pointing out the relevance of these for both the sacred artist and the practitioner, along with an overview of the history and iconography of Buddhist art. 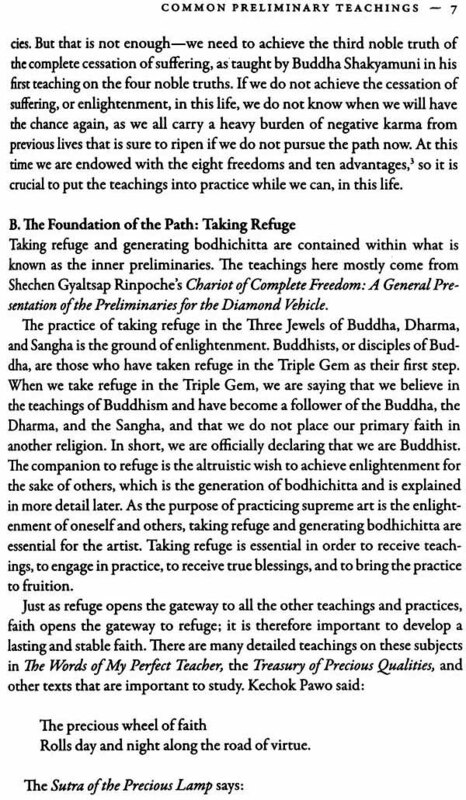 THE PATHS TO LIBERATIONS, written by the master painter Konchog Lhadrepa, on which this work is based, is an incredible resource. He wrote it based on his years of study, contemplation, and painting Tibetan sacred art, particularly in the Karma Gadri tradition of painting. 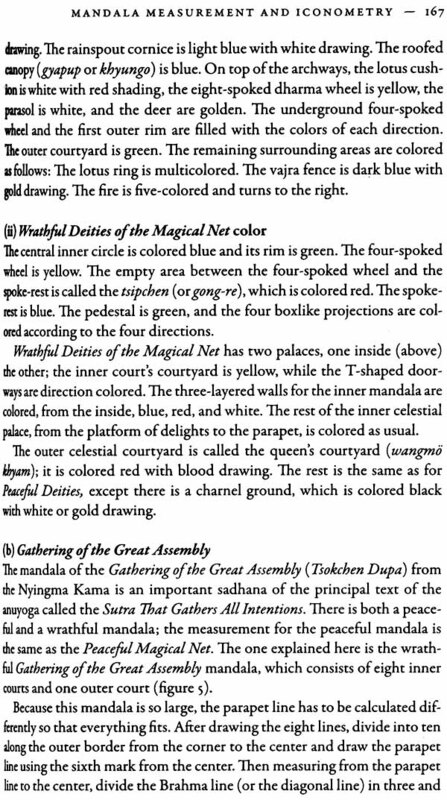 Here you will find histories, instruction, and a thorough overview of Tibetan sacred art, in particular the art of Tibetan tangka painting. Konchog-la was a very close disciple of and personal attendant to Kyapie Dilgo Khyentse Rinpoche. Rinpoche himself chose Konchog-la to train in all aspects of Tibetan sacred art under the personal tutelage of His Holiness the sixteenth Karmapa’s artist, Gen Lhadre Tragyal. Having excelled in his studies, Konchog-la returned to Kyapje Dilgo Khyentse Rinpoche’s monastery, Shechen Tennyi Dargyeling, and gave himself wholeheartedly to paintings tangkas, murals, tsakli cards, and so on. Whatever Rinpoche’s personal supervision. These paintings, tangkas, and murals can still be seen at our monastery. Under the direction of Kyapje Shechen RAbjam Rinpoche, Konchog-la established a school to train a new generation in Tibetan sacred art. In 1996, Tsering Art School officially opened, and the education of a new generation of artists began in earnest. Over the years, many students have trained under Konchog-la, and our TSering Art School continues to produce many skilled artists. Although these artisans are primarily from the Himalayan regions, our student body also boasts a few from the West. Charlotee Davis was one such student. In1998, she came to Nepal with the express wish to train in Tibetan sacred arts. She lived and worked at Tsering Art School for six years. Having graduated in 2003, she continues to paint and assist Konchog-la and the school. 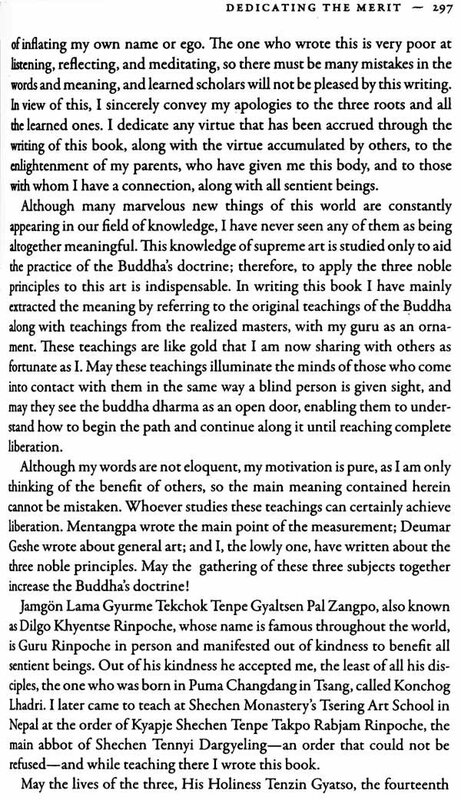 During her studies, as Konchog Lhadrepa gave an extensive commentary on his book The Path to Liberaion, Charlotee took extensive notes. These notes form the basis of The Art of Awakening, which is also supplemented with translations and annotations. It is a veritable mine of practical information, not only on the sacred art of ofTibet but on every of the practice of Vajrayana Buddhism. I would like to tank Charlotee Davis for her great efforts in the field of Tibetan sacred art and especially for sharing her knowledge with the wider English-speaking world. In conclusion, I’d like to request that you approach Tibetan sacred art not as just another style of paintings to look at, but rather as a means to enhance your own contemplative practice – to deepen the practices of mindfulness and meditation. THIS MANUAL for Vajrayana Buddhist artists-in particular, tangka painters-is based on Konchog Lhadrepa’s book in Tinetan called The Path to Liberation, which he wrote to assist his students at Shechen Monastery’s Tsering Art School in Kathmandu, Nepal, as well as for a broader readership. 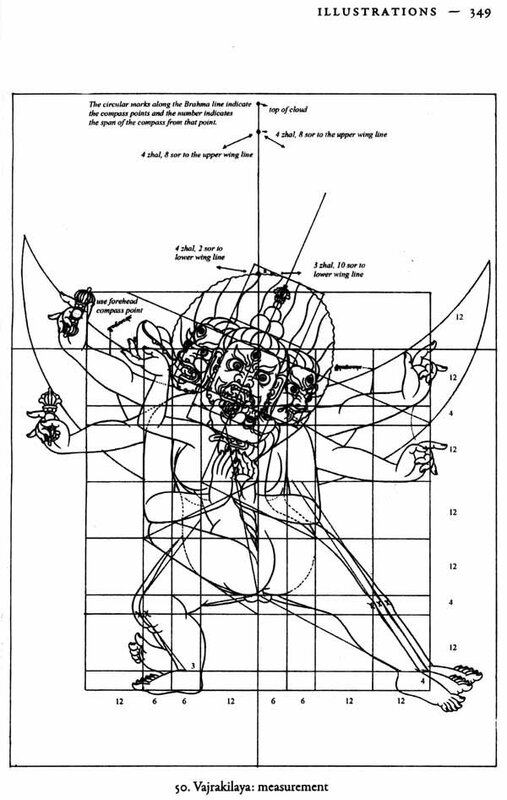 It is due only to the insistence of Konchog, and the blessings of Shechen Rabjam Rincpoche for the project, that I had the confidence to transcribe and edit an essentialized translation of Konchog’s book, through extensive ongoing discussions with konchog and additional research, published here as The Art of Awakening. This project began simply as lecture notes that I thought to type out and share with my fellow students. Although I have done my best to follow the structure and contents of Konchog’s book, many details are missing because of our limited skills in each other’s language and the difficulty of finding sponsorship to do a word-for –word presentation of the essential points and meaning of the original work. We were fortunate to receive the help of an experienced translator, Venerable Sean Price, to review and translate some of the most important sections. Of the book and received permission to paraphrase and quote from them, this has been very helpful. Konchog feels that the most important subjects, the structure, and the essence of his writings are conveyed in the present work, and that the level of detail and repetition traditionally found in a Tibetan text is not necessary for a Western audience. Also, this book includes additional oral teachings and explanations given by Konchog, so that many points are clarified here in a way that was not done in his original work. Yet, when this work is compared to the original Tibetan, there are sure to be many mistakes, which I deeply regret and for which I sincerely apologize. I hope that where the meaning does not correspond with the reference texts, at least it is not incorrect with respect to the Buddhist teaching. And I hope that the further help of qualified translators there will be revised editions in the future. Any errata, feedback, or comments can be sent to my e-mail (charlotee.e.davis@gmail.com) along with any expressions of interest in helping prepare or sponsor a future edition. The field of supreme art contains many specialized terms, and knowing these Tibetan words will be useful for anyone training in Tibetan art. In general, I have translated these terms using common architectural and colloquial vocabulary. 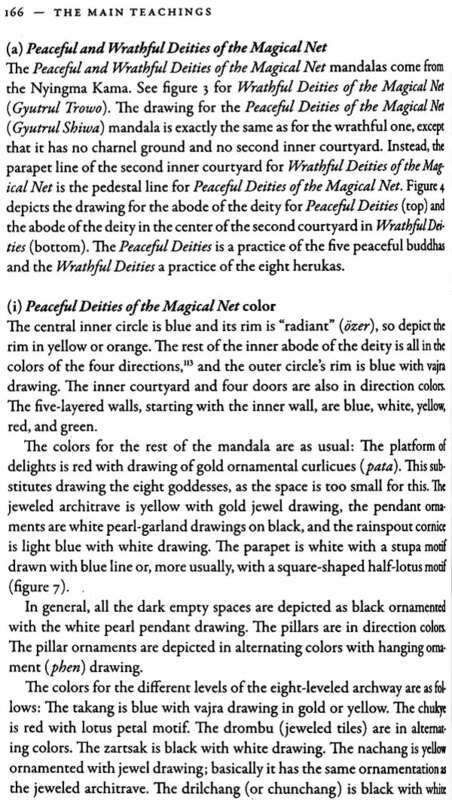 A few of the technical terms- for example, those for mandala drawing-I have left in phoneticized Tibetan so that the reader does not get bogged down by a profusion of lengthy translations. The glossary and the list of translation equivalents provide the wylie transliterations for key terms, which are given in phonetic Tibetan when they first appear. Text names are given in English translation only; the Tibetan spellings in Whlie transliteration can be found in the bibliography. Where possible, Indian personal names are given in translated English or Sanskrit, and Tibetan names appear in Tibetan phonetics or English translation. 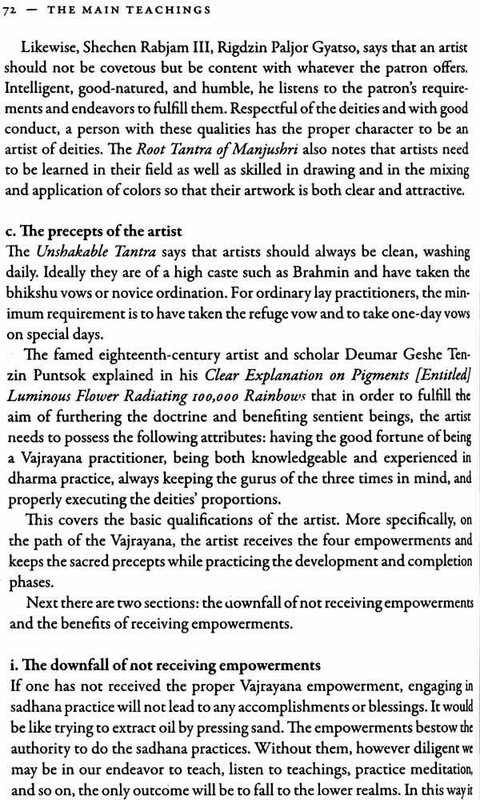 I HAVE CHOSEN THE teachings outlined in this text because most Tibetan art training does not include many Buddhist teachings, and the great art manuals from old Tibet assumed a certain level of scholarship that many aspiring artists today do not have. 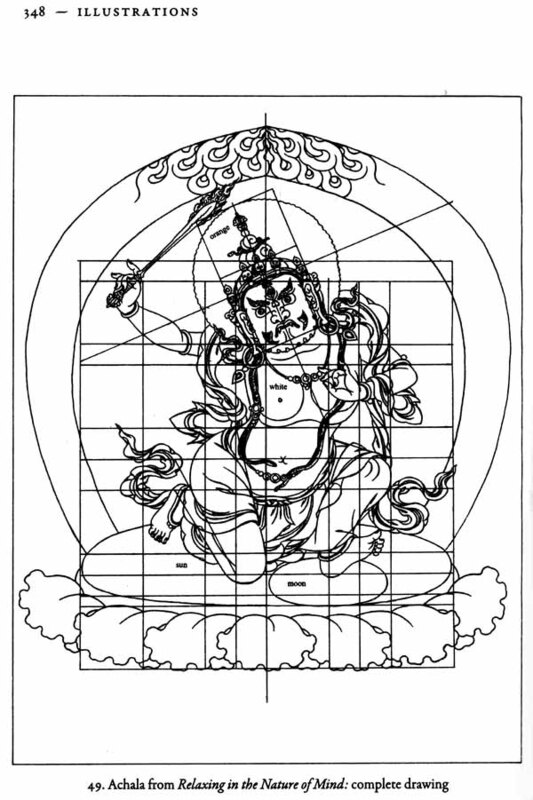 For artists to understand how to practice their discipline according to the Buddha dharma, they must have a good understanding to these teachings. In other words, the artist needs to know how to properly train in the two accumulations necessary to attain enlightenment- the accumulation of merit, which is the activity of body and speech, and the accumulation of wisdom, which is the mind’s activity. In the practice of Buddhist art, the proper creation of supreme images is the accumulation of merit, the accompanying attitude and motivation is the accumulation of wisdom. 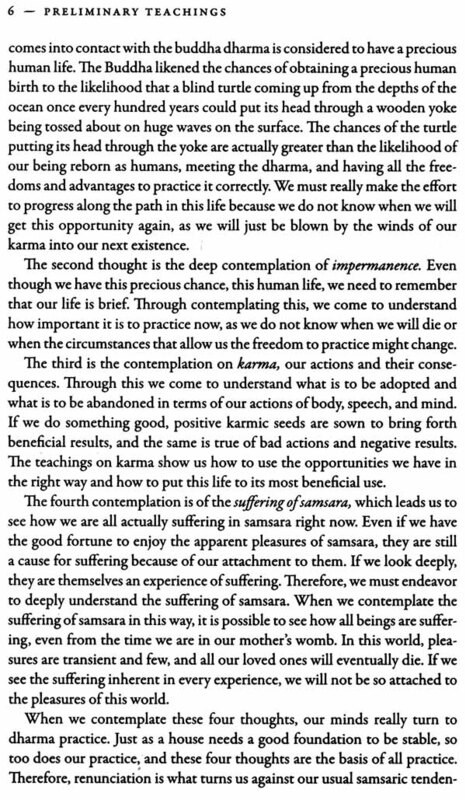 From the lower realms of samsara, the two virtuous qualities of treatises are healing form the cause (the three negative mental afflictions) and protecting form the result (the suffering of cyclic existence and bad migrations). These two supreme qualities out-shine all others. The purpose of the treatises is thus to change or improve our minds through the doctrine until complete enlightenment is attained. 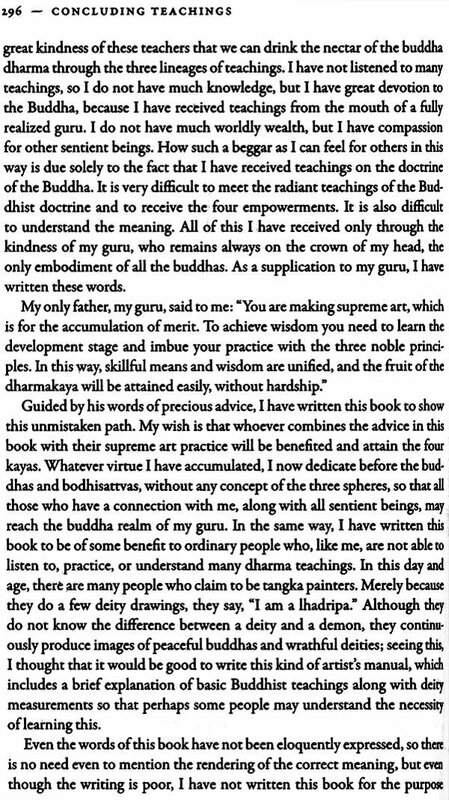 With the aspiration that the teachings in this book will assist in carrying out this supreme intention, I have divided it into three parts, corresponding to the three noble principles of (I) the preliminary teachings, (2) the main teachings, and (3) the concluding teachings, and dedication teachings and dedication. The preliminary teachings explain how to establish the ground of our practice as dharma practitioners and artists, fostering our faith and understanding The main teachings combine the teachings on the main practice with the practice of supreme art. The concluding teachings explain the benefits of these practices and how to dedicate the merit to the enlightenment of all sentient beings.